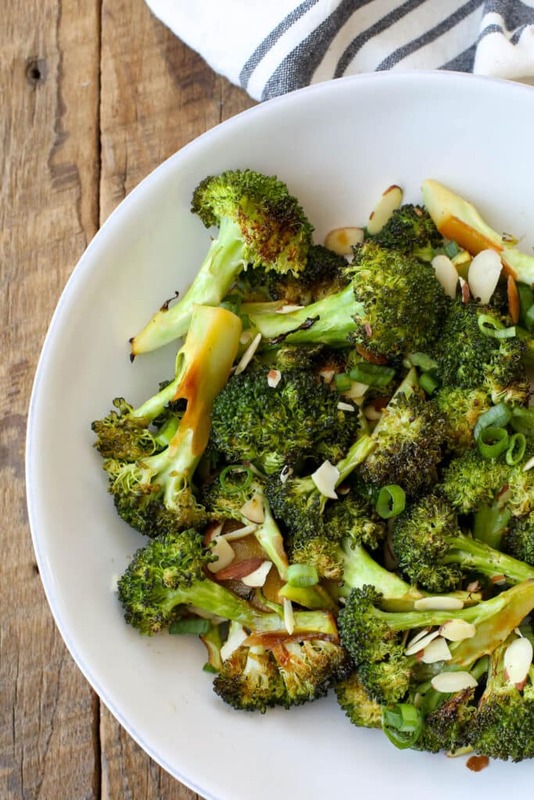 Crisp, hot broccoli with Sriracha, honey, soy sauce, and sesame oil is a combination that you simply have to taste to believe. This was a recipe that I stumbled across months ago and saved to try someday. I can not believe I waited so long to try this because this broccoli is amazingly good. 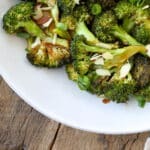 Sriracha Honey Roasted Broccoli just went running, skipping and jumping to the top of my favorite ways to cook broccoli list. Yep. I liked it that much. I’ve made it three times this week. Twice, I’ve eaten it all by myself for lunch. Ask me how much I care that my children don’t like broccoli. Nope, not a bit. It’s going to be on the table even more now. Lucky for them, they won’t have to eat it, because I have no intention of sharing it with their unappreciative palates. Edited to add: I’ve been making this broccoli on a regular basis for over 4 years now. I still love it every bit as much as I did the first time I made it. 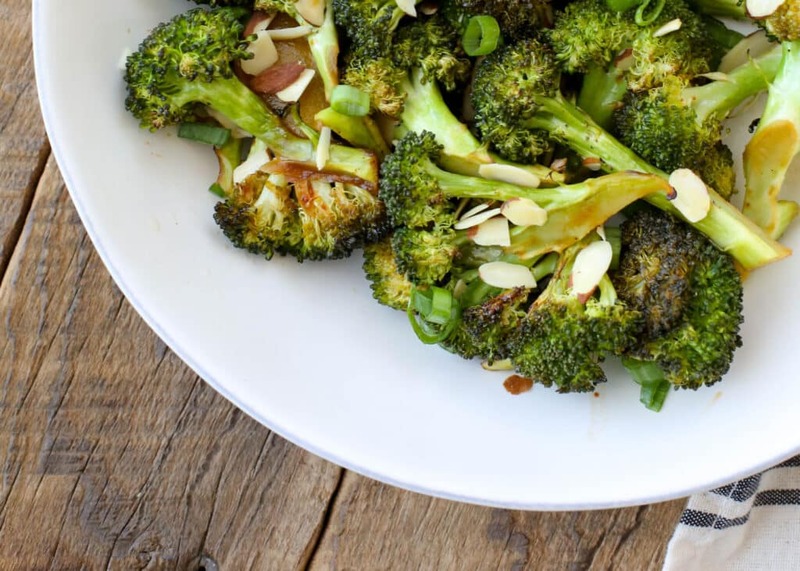 My kids still don’t love broccoli, but they eat Sriracha Honey Roasted Broccoli more willingly than any other broccoli recipe. I’m calling that a win for all of us. If you’re looking for more great ways to eat your vegetables, check out this Asparagus, Bacon, Corn, and Sweet Potato Skillet and these Roasted Brussel Sprouts with Apples and Bacon. Both of those are enormous favorites with my family and with everyone else who tries them. I have these Grilled Fajita Vegetable Skewers and this Grilled Summer Vegetable Salad on my list for later this month too. Kitchen Tip: I use this sheet pan for this recipe. Preheat the oven to 450 degrees. Line a baking sheet with a slipat mat or foil. In a small bowl or measuring cup, combine the soy sauce, sesame oil, honey, sriracha and pepper. Pour this mixture over the broccoli and toss well to coat. Spread the broccoli across the lined baking sheet. Place on the middle oven rack and roast for 8-12 minutes, until the broccoli is tender and the edges are turning brown. Remove the broccoli from the oven and transfer to a bowl. Toss with the green onions and the almonds and serve hot. Enjoy! Just tried this tonight and it was excellent! OMG! I love your blog. It always makes me so hungry. I need to give this a try. Thanks for sharing! This looks delicious and incredibly easy too! Nice to see a new recipe. Thank you for sharing!